San Luis Obispo County Sheriff’s Deputies arrested a fugitive Wednesday who rammed his vehicle into a sheriff’s car in December 2012. Marc Steele, 38, evaded arrest for more than nine months after ramming his Lexus sedan into a Sheriff’s K-9 vehicle in Atascadero and fleeing. Detectives determined that Steele was living at 7025 Portola Road in Atascadero. They believed he was armed and using a video surveillance system. Around 5 a.m. Wednesday, deputies surrounded Steele’s house and used a flashbang, also known as a stun grenade, to distract and capture Steele. A flashbang is a nonlethal explosive device that can temporarily blind or disorient a person. Several neighbors reported hearing gunshots after the explosion of the flashbang Wednesday morning. 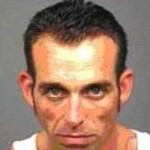 Deputies arrested Steele without firing any shots and without incident, according to a Sheriff’s Office press release. Members of the sheriff’s SWAT team and K9 units and Atascadero police officers assisted in the arrest. A California Highway Patrol helicopter also flew above the scene. Steele had three active felony warrants, including a charge of assault with a deadly weapon for ramming his car into the K-9 vehicle. Not true, he turned himself in back in December. Maybe a failure to appear? ?… if this guy was such a treat to public safety, how can he be released….there’s a few holes in this story. Well what were his other crimes? Again I feel to many other criminals are out there and no one is going after them. But this guy rams a police car and they send in everything they have to get him. Want to get away with a crime, just don’t do anything to the police or their equipment. Or better yet, pay off the justice system like the big banks did with the robo-signing and not only get away with past crimes, but future crimes, too!